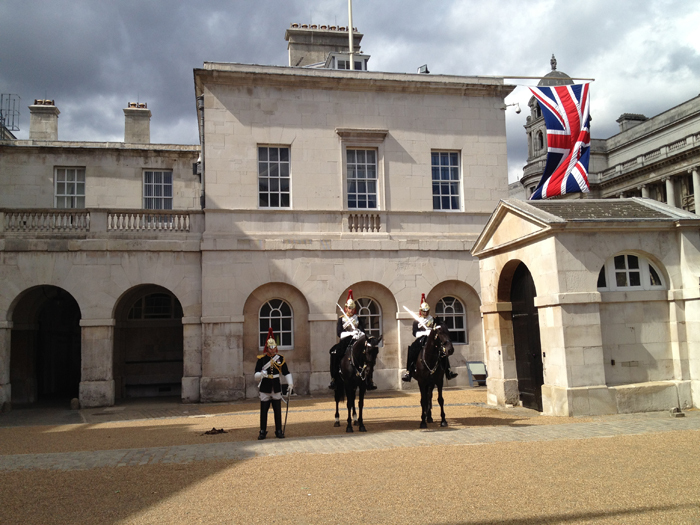 The changing of the Guard at Buckingham Palace might be the highlight of a London Tourist, but you can get close to the Queen’s black horses at the Household Calvary Stable. 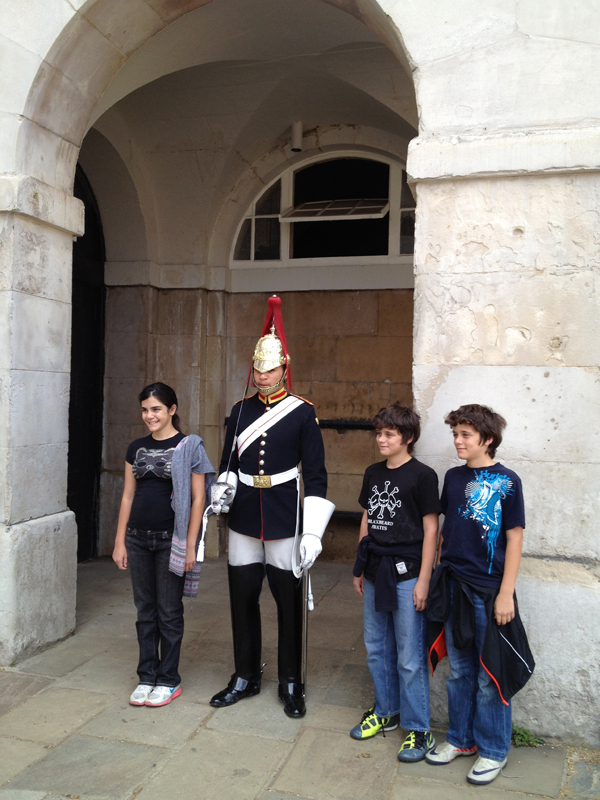 Like the guards at Buckingham Palace, the household stable guards are in full uniform and stand at attention without flinching or interacting with people around them. Obviously not allowed to move their hands, one amused us as he made funny faces trying to adjust his creeping chin strap without touching it. After getting their photos taken with the black horses, Mark and Ace wandered through the gate into the empty courtyard. Seeing the guard did not stop them, the crowd followed them in. Inside one lone guard marched back and forth. As he paused standing at full attention before turning around, Ace, Mark and Susan surrounded him and we snapped a photo. Mama-razzi moment finished, Ace walked to the bench under the roof and sat down. 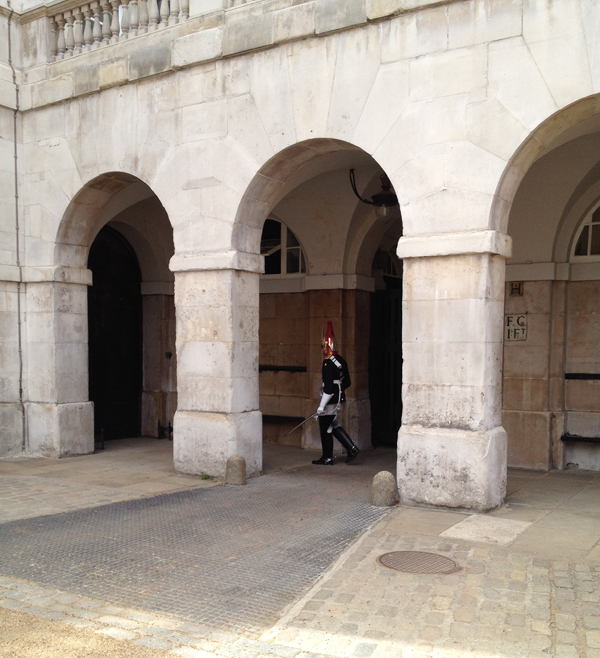 He got a front row seat as the guard marched towards him, spun on his heel, then marched back. On the return the soldier stopped in front of the large wooden gate. “Joe,” he whispered. Joe didn’t hear him, but Ace did. “Joe,” he hissed louder. A brown uniformed man came to the gate. “That boy is sitting,” the guard whispered. The man nodded and the guard marched on. The gate swung open and a soldier came out. He told Ace to move away then followed him as he returned to our circle. “That your boy?” the soldier asked. The man went back to the gate and came out with a long stick. He herded the tourist backwards towards the far side of the courtyard. Uncertain what would happen next, we stepped back until we saw a line in the gravel. After everyone was behind the line, the changing of the Household Calvary Guards began. There was a lot of pomp as the guards’ swords were checked for sharpness and boots were lifted to make sure there was no horse poop on the bottom. After a lengthy review, the horses were ridden behind the gate, the guards filed through and the gate was closed. 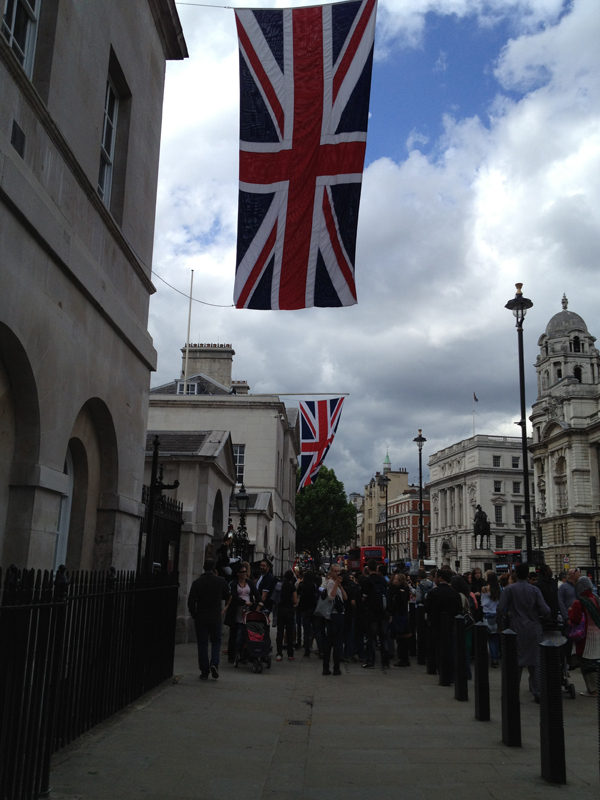 Lot’s of pomp for the Queen.